First let’s understand how LibreOffice organizes macros, both new ones that you create and those that come with the installation. 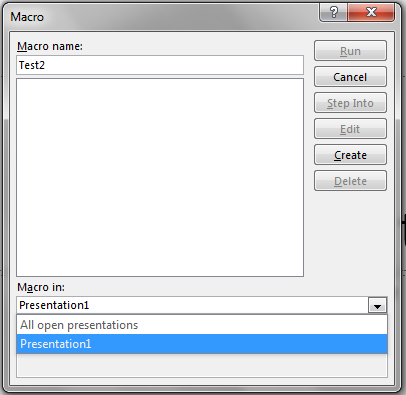 The Macros Selector is accessed by clicking Run Macros in the Macros sub-menu. It shows the three main sections (or folders) where macros are stored: My Macros, LibreOffice Macros, and one for the current document. All the dialogs for macros show this structure. Then highlight the Macros sub-menu. Clicking either Run Macros or Edit Macros will launch dialogs with these three folders. My Macros contains all the universal macros that have been created by you. Universal macros are available to more than one document. They can be used in current documents or new documents that you create. They may be able to run in any type of document. The script would run in an text document, spreadsheet, presentation, etc. Or they may only be available to one document type, such as a spreadsheet. 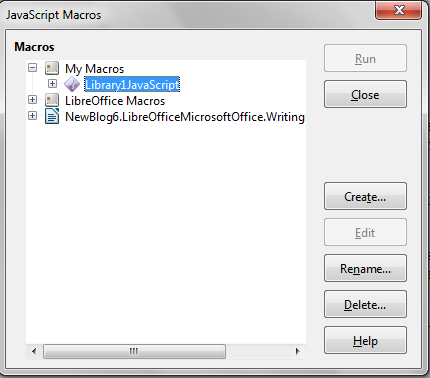 LibreOffice Macros contains all the macros that came with the installation. These scripts are in one of the four languages. For an individual document. This folder contains scripts in the four languages that are for that specific document. LibreOffice Basic, derived from OpenOffice Basic, has been the suite’s language for macros since it was forked from OpenOffice.org. features than the dialogs for the other three languages. It lists the three folders mentioned in the previous section. The folder will have sub-folders which contains the macros. When you click one of the macros, the different parts of the macro will be listed in the box to the right of it. You can click the Run button in the dialog to run the part you clicked on. You can create new macros in My macros or one of the ftolders for the open documents. As mentioned before, My Macros is for universal macros and the document folders are for macros for that specific document. Click on the folder or sub-folder where you want to store the macro. 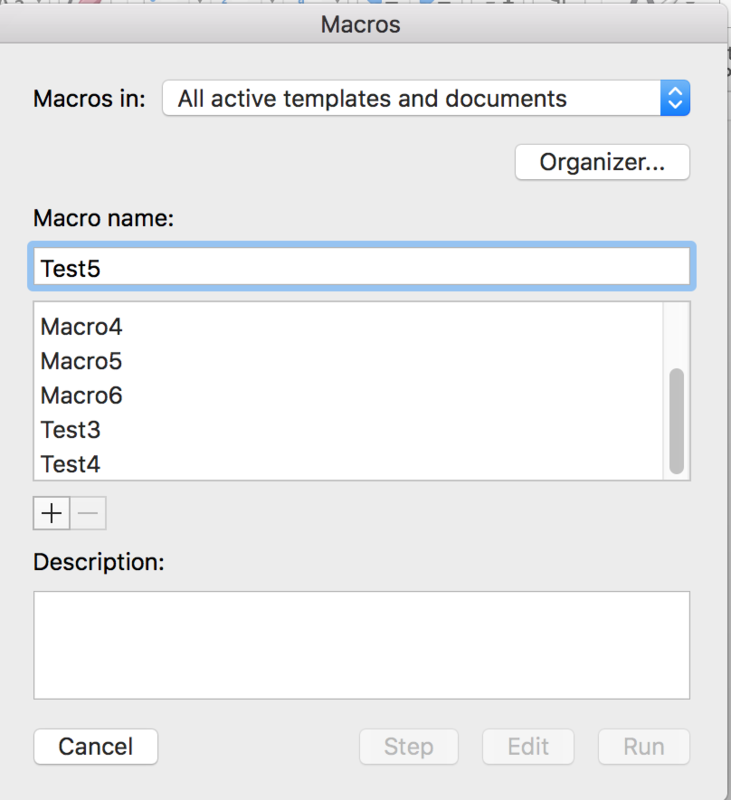 For example, if I want to store the macro in TestLibrary under My Macros, I click it. Then I click the New button, from the column of buttons at the right of the dialog. This launches a My Macros & Dialogs window. This is where you can write code for a macro in the LibreOffice Basic language. To learn more about the LibreOffice Basic language visit the following Web sites. It is the same as the OpenOffice Basic language. These have the same features, but they only show macros for the language you chose. First click the desired folder or sub-folder where you want to create a new macro. 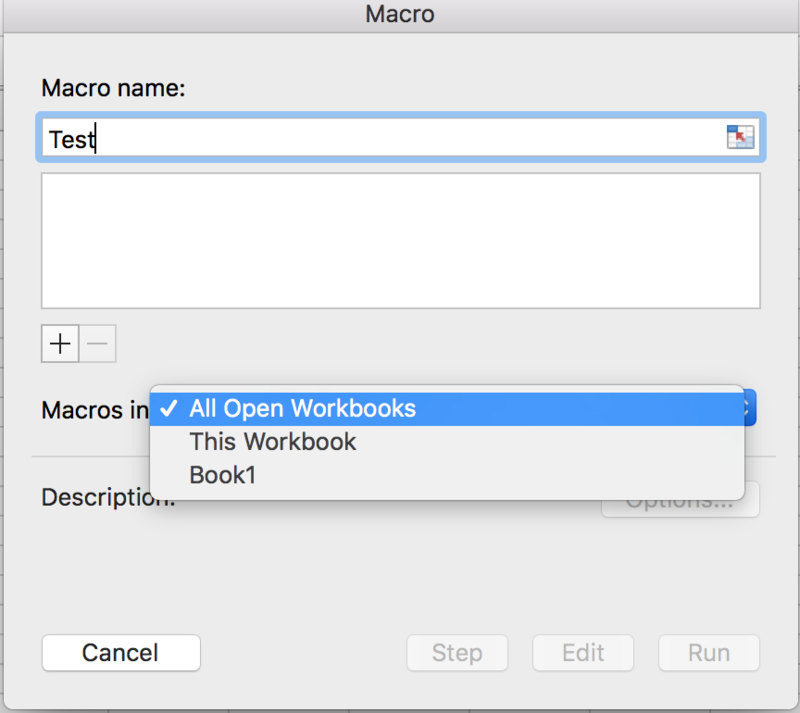 You can store a macro in any of the three main folders: My Macros, LibreOffice Macros, or one of the folders for the open documents. Click the Create button. Macros can only be created in a sub-menu. They cannot be created directly in My Macros, LibreOffice Macros, or one of the document folders. 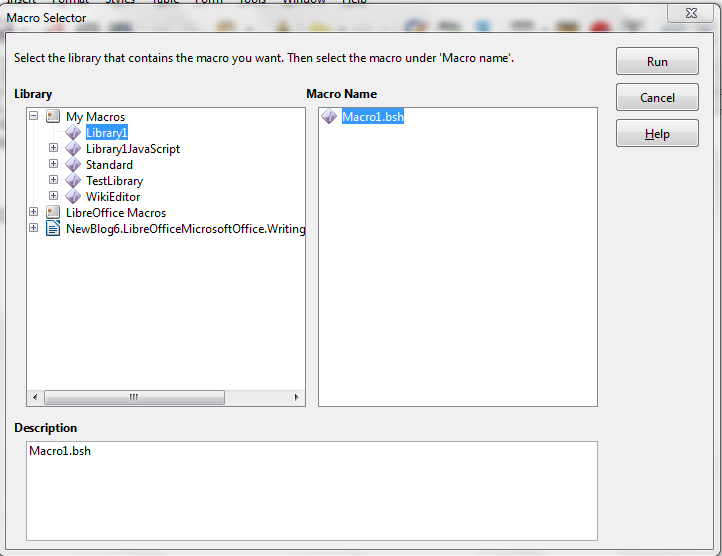 If you have selected a sub-folder, this will open a Create Macro dialog, where you can name your new macro. If you have selected My Macros, LibreOffice Macros, or one of the document folders, you can create a new sub-folder (or library). Clicking the Create button will launch a dialog to name the new library. Type over the default name, then click the OK button. Type the code to create a new macro. There are numerous resources for the three languages. Here are some popular ones. Macros are written in Visual Basic for Applications, a scripting language based on Visual Basic 6.0. They can be created in Word, Excel, PowerPoint, and Access for Windows and Word, Excel, and PowerPoint for Mac. Since Access has a different interface and dialogs for macros, it will not be covered in this article. The macro interface is the same in Word, Excel, and PowerPoint. Click View to reveal the View ribbon. Click the Macros icon. Do not click the arrow below it. This launches the Macros dialog. Type a name for the macro. 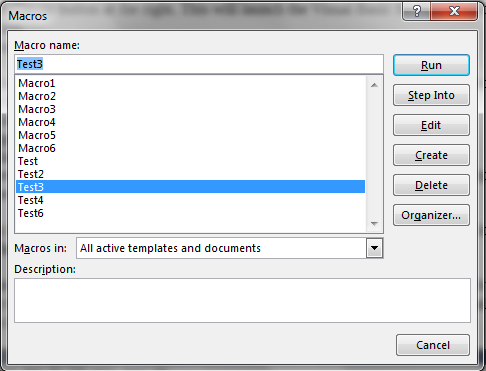 All active templates and documents: This setting makes the macro available to other documents. For creating a macro, this is the same as the Normal.dotm choice. Normal.dotm: This setting makes the macro available to other documents. (The name of the current document): This selection means the macro will only be available to this document. Click the Create button at the right. This will launch the Visual Basic for Applications application. An alternative to using the View ribbon is to use the Developer ribbon. The developer ribbon can be accessed in Word, Excel, and PowerPoint. Click Options. This launches an Options dialog. In the dialog, click Customize Ribbons. In the second box of the Customize Ribbon tab, click the check box next to Developer. When you click the Developer tab in one of the three applications, there is a Visual Basic icon and a Macros icon. The Macros icon launches one of the previously discussed dialogs. 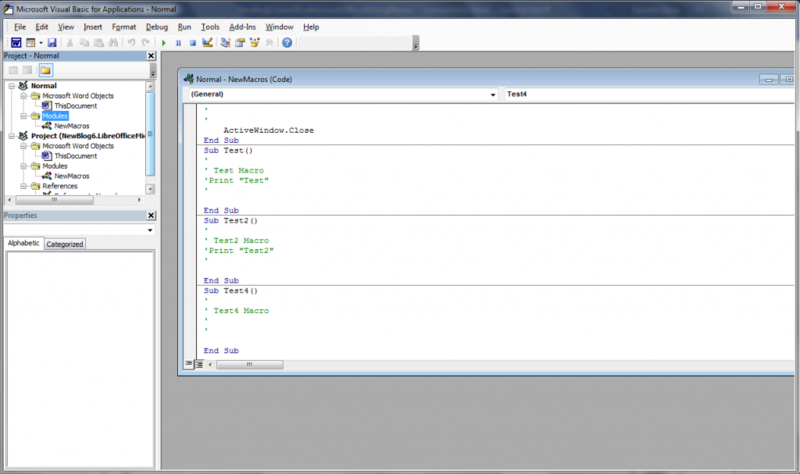 The Visual Basic icon launches the Microsoft Visual Basic for Applications application. You can choose whether the macro you are going to write in the Normal document to make it globally available, or you can save it to the current document, so it is only available to that document. This application is the same in Windows and Mac. 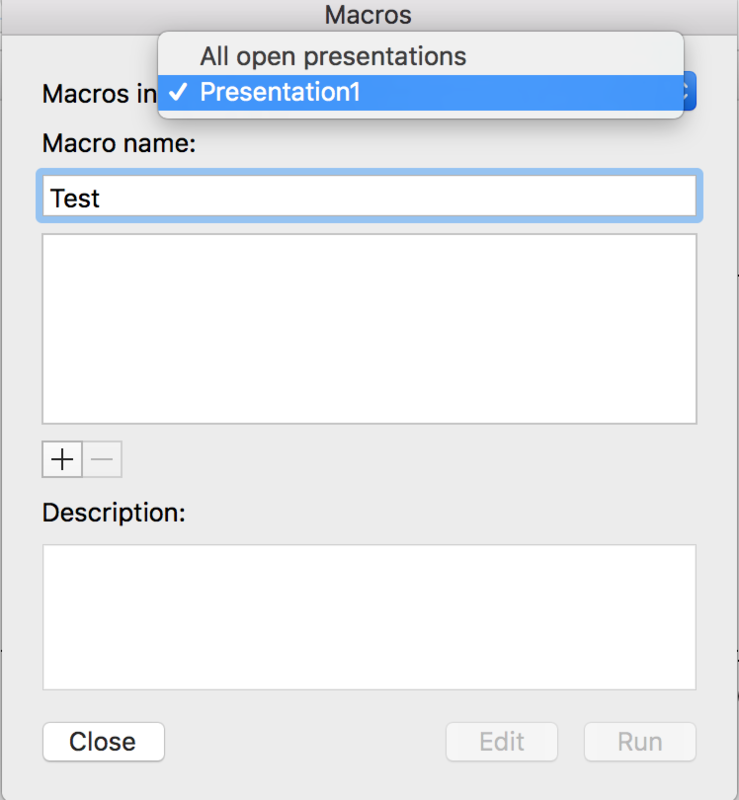 Macros in the Mac versions of Word, Excel, and PowerPoint have slightly different interfaces than their Windows counterparts, but they are mainly the same. Click the Macros icon. Do not click the arrow to the right of it. This launches the Macros dialog. Click the “+” button. This will launch the Visual Basic for Applications application. Click the Macros icon. This launches the Macros dialog. An alternative to using the View ribbon or the Tools menu is to use the Developer ribbon. The developer ribbon can be accessed in Word and Excel. Click the Word or Excel menu. Click Preferences. This launches an Preferences dialog. In the dialog, click Ribbon & Toolbar. 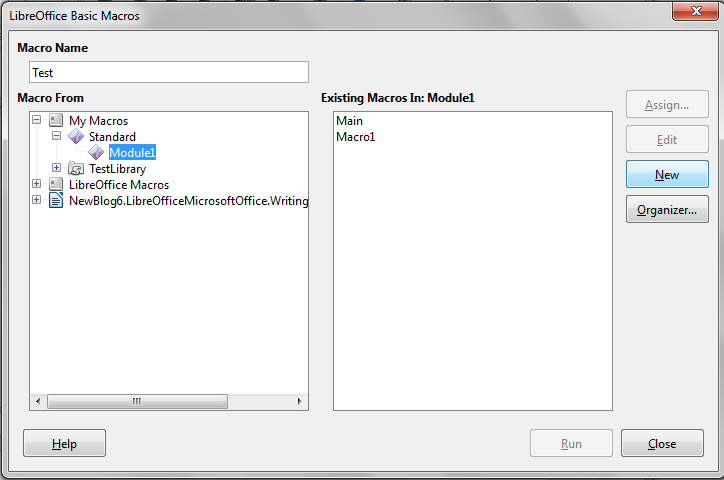 Creating macros in Office’s applications is also easier to set up than it is in LibreOffice. All you need to do is open the Macro dialog, give the macro a name, choose whether it is global or simply tied to one document (if you are writing it for Word). 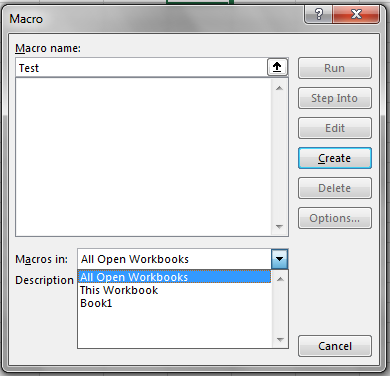 In LibreOffice, you need to know what library you want to create the macro in and then make sure you are using the dialog for the language you want to write in. LibreOffice is more flexible than Office. There are four languages to choose from rather than just one. This means that power users with different programming skills will have an easier time creating macros in LibreOffice than Office. The centralization of the apps in LibreOffice also makes it flexible. You can create macros that work in multiple applications. The dialogs and libraries for macros also can be accessed from anyone of the applications. You can see spreadsheet macros when you launch the macro dialog from a Writer document, for example. Office users can only see spreadsheet macros from Excel. They cannot see them when they are using Word or PowerPoint. There is not an easy way to write a macro that works in Word, Excel, and PowerPoint equally. While not as many people write macros in LibreOffice as do in Office, the open-source suite is more welcoming to programmers from different backgrounds because of this flexibility. It is a familiar tool for many more programmers.